Reflect a piece of your personality on your walls with standout pieces by local artists from Kolkata. Whether you are an art connoisseur or a first-time buyer, here’s a guide to help you pick your favourite artwork to enliven a dull space in your casa. Every year, aspiring collectors queue up outside CIMA Art Gallery, as early as 6am, waiting eagerly for its annual Art Mela to begin. A constant fixture on Kolkata’s annual cultural calendar, the Art Mela sells work by the masters, alongside emerging stars, for as little as a few thousand rupees. You can pick up works by some much-loved artists such as Ganesh Pyne, Arpita Singh, Thota Vaikuntam as well as those by younger upcoming ones. They have something to suit every taste and the art is affordably priced ranging from INR 3,000. Nandan Mela is a special attraction for art lovers, organised every year (December 1 and 2) by the department of Kala Bhavan (Shantiniketan) to commemorate iconic artist Nandalal Bose’s birth anniversary. It is a momentous occasion, where all artists, who teach at Kala Bhavana, paint for the residents of Shantiniketan. There, you would find teachers and professors buying art for as little as INR 10, or you could buy a KG Subramanyan work for just INR 100! There's a variety of artwork to choose from at affordable prices - no wonder thousands of art lovers from India and abroad throng the fair. You can pick up indigenous art of new artists and masters like Paritosh Sen, MF Hussain, Asish Gupta, and Partho Ghosh from exhibitions at various art galleries across the city. These galleries curate great collections of classic as well as contemporary art featuring established and aspiring local artists. These are great places to browse through all kinds of art whether it is symmetrical, abstract, landscape or fantasy and check if the artist’s expression resonates with your personality before you invest in the painting. Check our recommendation on art galleries in Kolkata here. Some of our fave cafes - such as 8th Day Café and Artsy - serve as mini galleries for young artists in the city enabling them to pursue their passion. 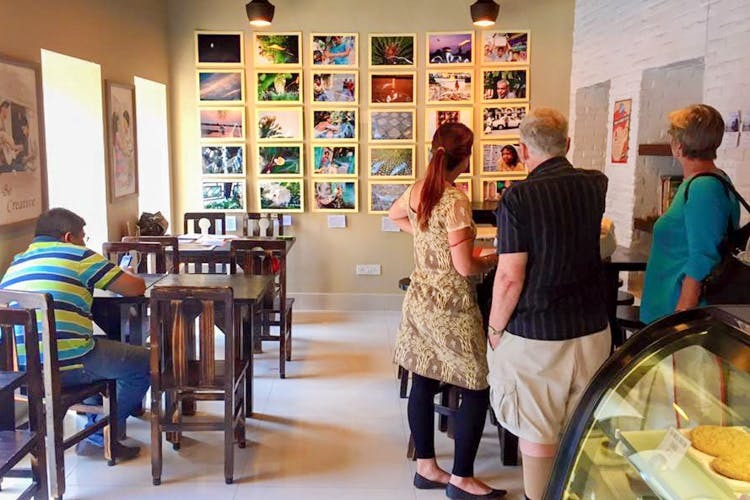 These cafés have a dedicated space where they display an aspiring artist’s work every month. They also organise open house sessions where you can interact with your favourite artist. The works displayed here are for sale at very affordable prices. So while you wait for your coffee to brew, you can decide on which painting you would like to take home with you. Read about cafes that showcase new artists here. If you have enough paintings adorning your walls, you might want to try something hatke by wallscaping using collectibles such as Bengal folk art, masks and ceramic or brass plates. Pick up different types of masks from across Bengal, from papier-mâché- based Chhau to the wooden Gambhari and Bagpa at Biswa Bangla stores. Places like Kamala at ICCR (check it out here), Byloom, Deshaj (read about it here) and several state emporia at Dakhinapan also stock masks. Try out wall montages done with ceramic or bone china plates which are readily available at Aranya in Dakhinapan and crockery stores New Market. You can visit Rajasthali for blue pottery plates and the Central Cottage Industries Emporium for marble ones. Group your wall art pieces according to either colour, texture or symmetry in order to avoid visual clutter.